Paris, France - Football fans celebrate in front of the Arc de Triomph after France's victory against Croatia in the 2018 World Cup Final. Oaxaca, Mexico - A palenque in Matatlan, Oaxaca, 2018. Sebagoro, Uganda - Children play with home-made fishing rods on the banks of Lake Albert, 2018. London, U.K. - St Paul's Choristers rehearse at the Cathedral. FRANCE, Calais: French riot police advance towards the Jungle migrant and refugee camp during a clash. U.K. Aylesbury - US President Donald Trump and British Prime Minister Theresa May hold talks at Chequers, 2018. GUCA, SERBIA: A brass band performs in a restaurant during the Guca Trumpet Festival on August 11, 2017 in Guca, Serbia. 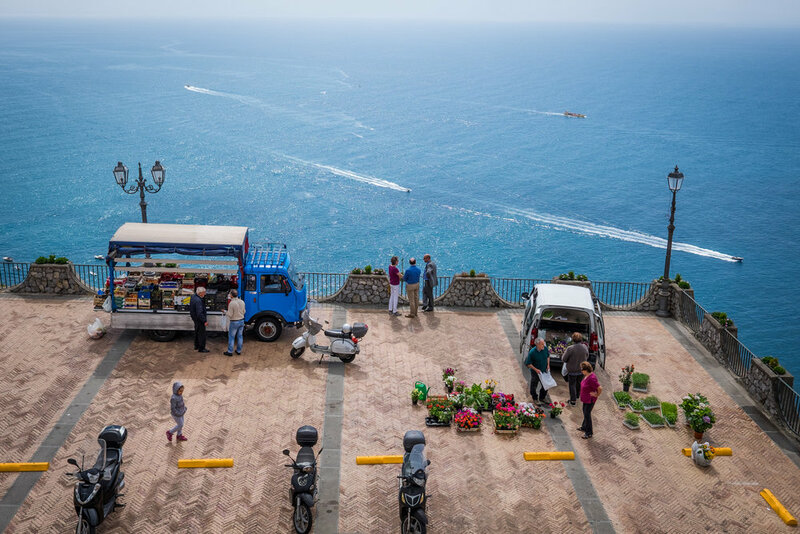 ITALY, Praiano: People gather at a market as boats sail past in the Mediterranean Sea. U.K. London - Football fans react to England losing to Croatia during a World Cup semi-final screening in Hyde Park, 2018. UNITED KINGDOM, London: Revellers at the Notting Hill Carnival 2016. LONDON, UK : Yeoman Warders enjoy a drink of sherry before a Christmas State Parade, 2016. FRANCE, Calais: Syrians keep warm around a fire at the Jungle refugee camp in Calais. NEPAL: Young men climb a rock in Tashiling. UNITED KINGDOM, London : The 70th annual "Clowns International" church service at the Holy Trinity church in Dalston in east London, England on February 7, 2016. The service celebrates the father of modern clowning, Joseph Grimaldi, who died in 1837. UNITED KINGDOM, London: Wikileaks founder Julian Assange speaks from a balcony at Ecuador's embassy in London as Britain rejected a UN panel's ruling that called for Assange's "detention" at Ecuador's embassy in London to be brought to an end. UNITED KINGDOM, London : Tower Hamlets residents attend a public meeting. U.K. London - Models display creations from the Templerley London SS15 collection at London Fashion Week. U.K. London - Marina Litvinenko, widow of former KGB spy Alexander Litvinenko outside the High Court. Barcelona, Spain - Young protesters draped in Spanish flags run under a giant Catalan flag during a pro-unity demonstration, 2017. INDIA, Varanasi - a man jumps into the River Ganges. U.K. London - Australian art on display at Christie's auction house. U.K. London - Misty morning in Richmond Park. 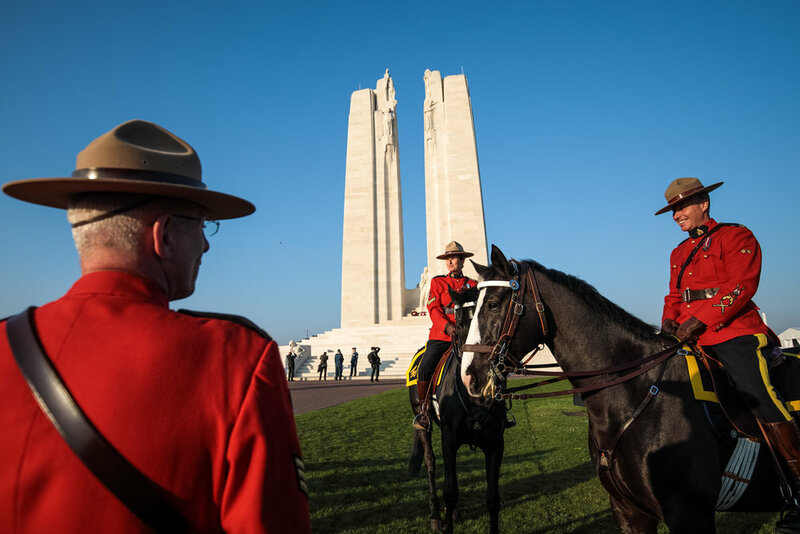 VIMY, FRANCE : Royal Canadian Mounted Police are pictured in front of the Canadian National Vimy Memorial. U.K. London - Protesters burn the Israeli flag outside the U.S. embassy. Oxford, U.K. - Members of the Magdalen College Choir prepare to sing the Hymnus Eucharisticus from the top of the Great Tower, Magdalen College, 2018. Barcelona, Spain - A couple walk down hill in El Carmel as the sun sets, 2017.